I started this blog to share what I have learned from studying transferware. 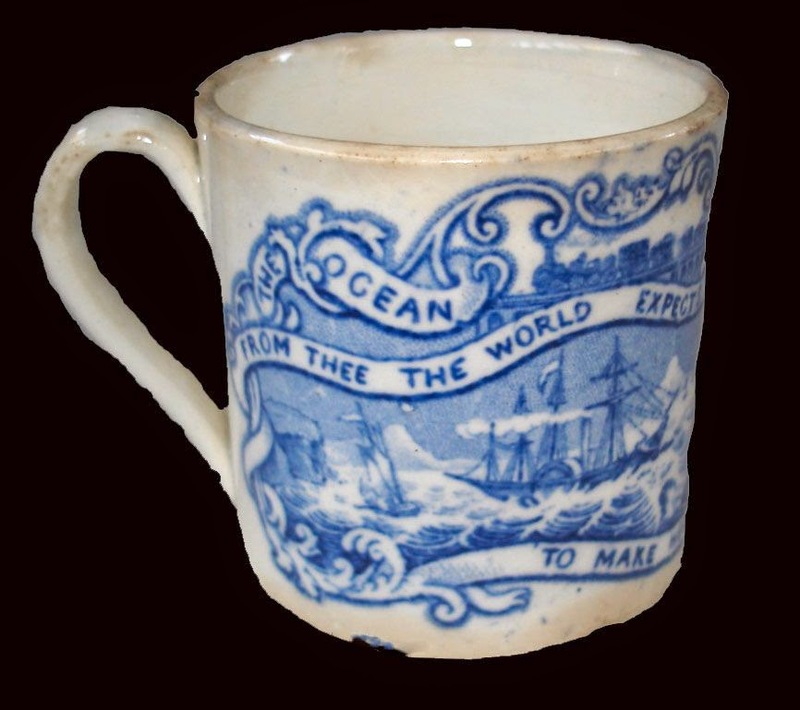 A pattern titled Ocean Postage was sent to me by my friend, Michael, for the Children's Category of the Transferware Collectors Club Pattern and Source Print Database. I hadn't a clue what the pattern was about, so I went to Wikipedia. 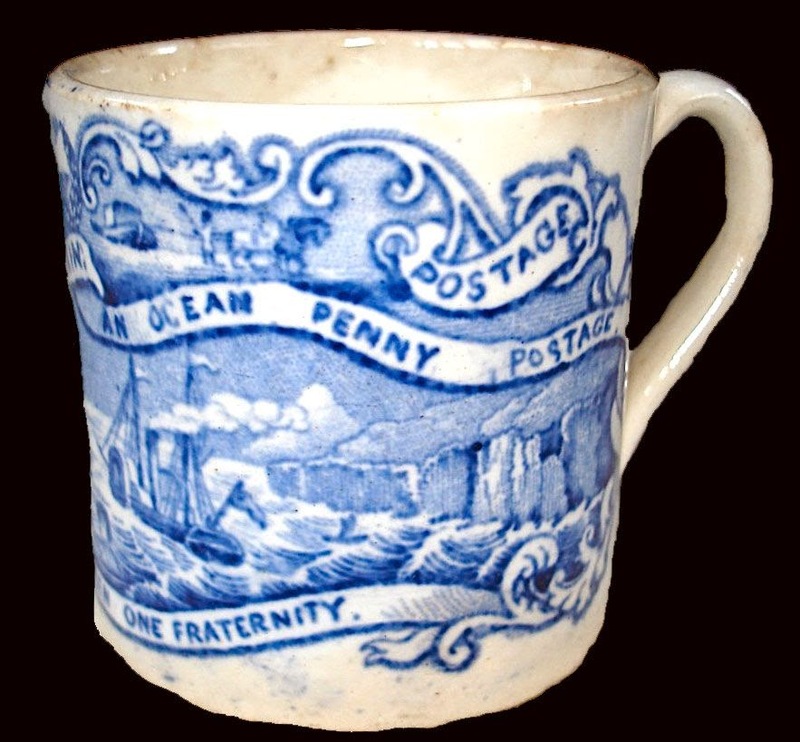 Wikipedia says British postal reforms brought cheap rates to the national mail system in 1840. However, it was still expensive to send mail to other countries as there were no standardized methods to calculate costs. In 1846 a campaign was launched by Elihu Burritt, an American philanthropist, to standardize overseas postage. The philanthropic idea was that cheap international correspondence would encourage universal understanding and peace (a lovely idea). In 1875, a Postal agreement was signed between 22 countries establishing unrestricted standard rates. The above pattern commemorates this event. It depicts the steam powered sailing ships with paddle wheels (the first ships to regularly carry mail between England and the United States). Symbolic dolphins and mermaids herald the event. 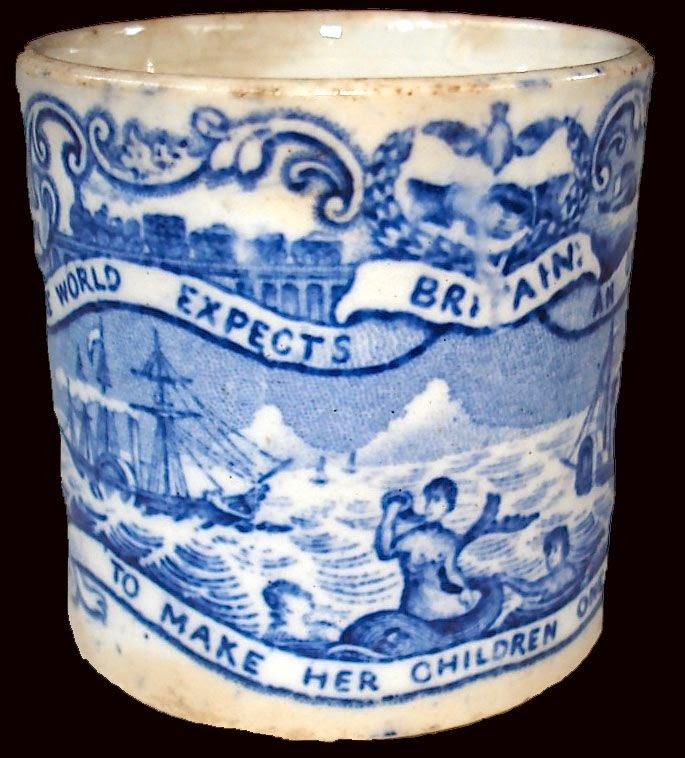 The entire text reads: The Ocean Postage - Britain, from thee the World expects an ocean penny postage, to make her children one fraternity. Two vignettes and a cartouche appear above the upper banner. The cartouche shows a pair of clasped hands (dark and light), a dove, and a heart-shaped wreath of laurel leaves. All of these symbolize friendship and peace. A train runs across a railway bridge in a vignette to the left of the cartouche. Perhaps it is the Great Western Railway which is bringing the mail to the ships. The vignette to the right of the cartouche shows a boat pulled by horses, perhaps on a canal. The canal boat may also be a mail boat. I'd never really thought about the history of postage. The pattern on this mug opened a window onto new knowledge. This is SO interesting! In the UK much is made of the first penny post system, but I've not heard about the history of early international post before. I have learned so much from collecting transferware. Acutually, I have learned a lot from most antiques. Bits of history. I love the gorgeous photos on your last blog post. Such rich reds and blues.